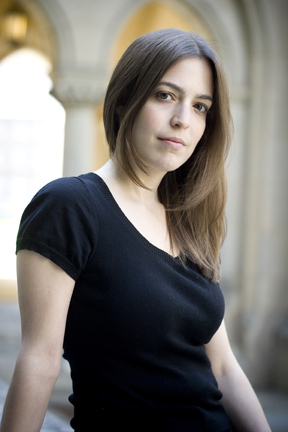 Washington, D.C. poet and nonfiction author Sandra Beasley has been selected as HoCoPoLitSo’s 20th writer-in-residence. Beasley joins a fine roster of accomplished poets, writers, and memoirists who have served the students of Howard County public schools for Howard County Poetry and Literature Society, which is celebrating its 38th season. Throughout the 2011–2012 school year, Beasley will share work from her second collection of poetry I was the Jukebox at the twelve county high schools; Homewood Center, an alternative school; and Howard Community College. Ms. Beasley will begin this week at Glenelg and Reservoir High Schools. The writer-in-residence program was designed to give students access to an author who visits each school to read and discuss poetry and literature, the writing life, and selected works. More than a thousand students have benefited from the program in the past few years. Beasley’s second poetry collection, chosen by poet Joy Harjo, won the Barnard Women Poets Prize in 2009. Harjo calls Beasley’s poems “crisp and muscular,” “decisive and fearless.” “Every object, icon or historical moment has a soul with a voice.” Theories of Falling, Beasley’s debut collection, was selected by poet Marie Howe as the winner of the 2007 New Issues Poetry Prize. Beasley was featured on NPR’s “The Diane Rehm Show” for her most recent work, Don’t Kill the Birthday Girl: Tales from an Allergic Life. Beasley writes a blog called Chicks Dig Poetry, and travels the East Coast spreading the cheer of poetry. Last year, HoCoPoLitSo won the Howard County Public Schools’ Friends of Education Award and an honorable mention for the Governor’s Service Award for its work in the schools. HoCoPoLitSo’s high school liaison, Virginia Pausch, who arranged visits and accompanied the authors, retired last year. Joyce Braga is the current liaison, and is charged with coordinating the author’s visits. “”Make new friends, but keep the old. One is silver, and the other is gold.’ For more than three decades, HoCoPoLitSo has been a ‘golden’ friend to the Howard County Public School System. How exciting it is when writers visit each of the high schools where students are provided an opportunity to listen to and dialogue with HoCoPoLitSo’s writer-in-residence,” says Zeleana Morris, board member and secondary language arts coordinator for Howard County Public Schools. Past writers in residence have included: Michael Collier, Roland Flint, Kendra Kopelke, Truth Thomas and E. Ethelbert Miller, among others. HoCoPoLitSo, Howard County Poetry and Literature Society, has been enlarging the audience for contemporary poetry and literature since 1974. HoCoPoLitSo is supported by the Howard County Arts Council through a grant from Howard County government, the Maryland State Arts Council through the State of Maryland and the Department of Business and Economic Development, the National Endowment for the Arts, the Columbia Foundation, the Jim and Patty Rouse Charitable Foundation, Howard County Public School System and Friends of HoCoPoLitSo. Download an image file of Sandra Beasley.